Find and learn everything you need to know about Crotia, its culture, attractions, cuisine, shopping options and smart travel tips here. Architecture, sun, sea and gastronomy dainties are basic words that can easily describe a magnificent country such as Croatia is. 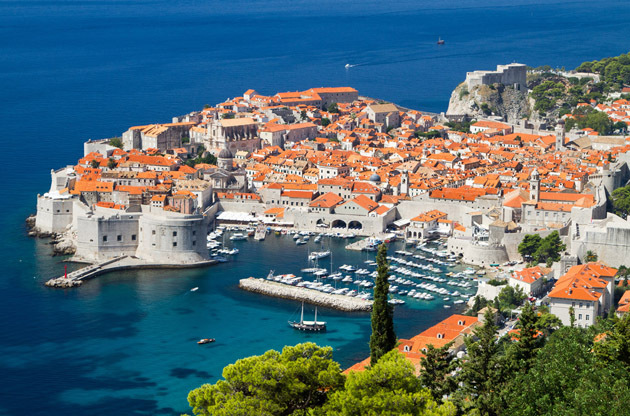 Settled on the coast of Adriatic sea, Croatia is the unique country where visitors can enjoy the benefits of two climates – Continental and Mediterranean. Besides, there are eight national parks, Geopark, architecture from the Renaissance and the Baroque period, magnificent landscape and over 1.000 Croatian islands that will help you to discover the true spirit of this country. The capital town of Croatia is Zagreb. It is settled in the central of Croatia, only a few hours away from the tourist places in Slavonija, Medimurje, Zagorje and Dalmatia. No matter which part of Croatia you will choose for sightseeing – continental or sea part, you will be astonished with breathtaking moments you’ll experience during the visit. Croatia has approximately 4.5 million of citizens of different nationality and religion. People in the Slavonia region are called Slavonians, in the Zagorje region Zagorci, in Medimurje region Medimurci and in Dalmatia Dalmatinci. Crotia is located on where Central Europe, Southern Europe and Mediterranean meets. Visit Medimurje, a home of Croatian version of Napa Valley – Sveti Urban. Amazing autochthonous cuisine and irresistible sorts of wine will let you experience Medimurje and its true spirit in the right way. Another must-see-place, only a few miles from Sveti Urban is picturesque town Varazdin. It is a town of rich historical, architectural and cultural heritage. Also, Varazdin was the capital city of Croatia until 1776., when a great fire took a place. Here you will want to see Old city, Cathedrale, Museums as well as the place where guardian-angels sleep. In Kvarner and Istria you can visit the amphitheater in Pula, archipelago Brijuni, and in October you can visit Chestnuts festival in Lovran, as well as to try famous Istrian Truffels combined with Istrian pasta. On your way to Dalmacija stop in Plitvicka Lakes. For only 15 EUR you will have the opportunity to see 16 lakes that make magnificent phenomena surrounded with over hundred years old woods. You can visit amazing Castle Trakoscan which is approximately 40 kilometers away from Varazdin, and 80 kilometers from the capital of Croatia. According to the legend, Trakoscan was named after knights Drachenstein . In the museum in the castle you can see a large number of pictures dated from the Renaissance period, as well as some historical items. You can also visit city Opatija settled in the heart of Kvarner, or travel to island Hvar and enjoy in inexpressible colors of lavender fields. If you visit town Rijeka in February, you will have a chance to see the International festival carnival, and in August make sure to visit Spancirfest – festival of good emotions in Varazdin. Croatia offers a major number of them that will remind you on time spent in Croatia. You can buy Croatian silk tie “Croata”, pendant “Rijecki morcic”, or just a bottle of wine and rakija. If you are visiting Pag, don’t forget to buy Paski cheese or salt “Paska Ruza”. Bring a lavender oil and olive oil from Hvar. Croatian cuisine is well known around the world. Simple food preparation guarantees the best taste in the dishes. In continental part of Croatia you can try famous Slavonian "Kulen" with chili peppers, rolls “Varazdinski klipic”, cake Medimurska gibanica or most desirable Samobor custard slices. Dalmacija is well known by a grilled tuna fillet, roasted scampi and squids. You will want to taste Traminac, Pinot, Sipon and Malvasi, a famous sort of wine. Water in Croatia is excellent quality, so you can consume it from the water-pipe, or, if you like more, you can buy bottled water. Croatia has three major airports – in Zagreb, Zadar and Dubrovnik. If you are planning to see continental part of Croatia than the Zagreb airport is the best choice for you. You can also use services of foreign airports such as Ljubljana or Graz, which are only 1-1.5 hours away from the capital of Croatia. Rent a car is very popular in Croatia. You can drive up to 70-90 kilometers per hour on the roadway, and if you are taking on highway speed limit is 130 kilometers per hour. Croatia, having an easily accessible location in Europe and favourable climate, remains as an ideal hub for global business or academic events. The beautiful nature and cultural activities add much up to the charm of this country and many attendees from all around the world come to Croatia for reputable sector leading events such as conferences, congresses, fairs, exhibitions, tradeshows and symposiums each year.